The InFocus IN119HDx is a new low-cost 1080p projector for business and education. 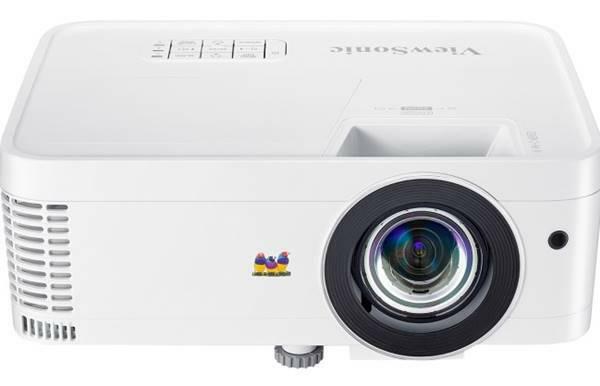 With a compact design, bright picture, and long estimated lamp life, the IN119HDx is a flexible projector that works well in conference rooms and classrooms. Its light weight of less than five pounds makes it portable, while a plethora of connection options means it also works well in fixed installations. And at only $549 retail, the IN119HDx is one of the least expensive 1080p projectors available anywhere. Built for classroom and conference room use, the IN119HDx is designed to deliver a bright picture. The projector creates an image powerful enough to combat moderate ambient light. On startup, the projector displays a stylish blue InFocus splash screen; after a few seconds, the image kicks over to whichever source you have connected. The source search process can be a little slow, but the projector starts with the most commonly-used source (HDMI) and proceeds from there. In bright rooms, you can use a small screen size to maintain image brightness and combat ambient light. However, smaller screen sizes exacerbate the projector's brightness uniformity issues, especially on a 100% white screen or similar content such as a text document or spreadsheet. Seen on a smaller screen, the top left corner is noticeably dimmer than the bottom right. This is less evident in video, photography, or Powerpoint slide shows, since color tends to interfere with one's perception of brightness. Speaking of color. The IN119HDx's color accuracy is inversely proportional to its brightness at any given moment. In the projector's brightest modes, color appears dull, undersaturated, and murky. In the less-bright image modes, like Video, color has much more apparent saturation and looks more natural. If you are displaying content that demands color accuracy, make sure to use an appropriate image mode to do so. I didn't see where this IN119HDx has a remote. Does this item comes with a remote? wow, this is suppose to be a 3300 lumens output. BUT, your test only gives it 2400 output lumens. WHY the big difference. How was this test done. AND what about the Infocus 1128HDx... does it suffer the same lower lumens. Did you test it? What were the results from 1128hdx ?